For most girls, sleepaway camp is great fun. But for Amy Becker, it’s a nightmare. 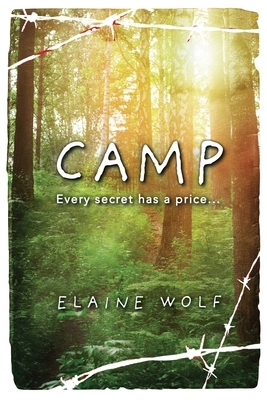 Amy, whose home life is in turmoil, is sent to Camp Takawanda for Girls for the first time as a teenager. Although Amy despises spending summers at home with her German-immigrant mother, who is unduly harsh with Amy’s autistic younger brother, Amy is less than thrilled about going away to camp. And her reluctance about camp is only the beginning. At Takawanda Amy finds herself subjected to a humiliating initiation” and also to relentless bullying by Rory, the ringleader of the senior campers. As Amy struggles to stop the mean girls from tormenting her, she becomes more confident. But then her cousin reveals dark secrets about Amy’s mother’s past, setting in motion a tragic event that changes Amy and her family forever. Winner of the Forward National Literature Award and a book-of-the-month pick by the Holocaust Memorial and Tolerance Center of Nassau County (NY), Camp is an acutely sensitive and compelling novel that will resonate with a wide readership. Elaine Wolf is an award-winning fiction writer, a former reading/language arts specialist and school district program administrator, and a writing workshop facilitator. As the daughter of a German immigrant, and as a former camper and camp counselor, she writes of a world she is passionate about and knows well. With an exceptional reputation as the anti-bullying novelist,” she shows what really goes on behind the closed gates and doors of our camps and schools. Learn more about Elaine at authorelainewolf.com. Elaine and her husband live in Northampton, Massachusetts.